A reader wrote me and asked: “I am currently working on a project on how to identify the next generation of leaders(Gen Y). I was wondering if you could give me a few ideas on how to develop leadership in the work environment. “? Thanks for the question. I’d be glad to give you a few ideas. In fact, the purpose of my blog is to do just that – help identify and develop leaders. Did you take a look at the archives section? Look for the “Blog Archive”, right under the “ask me a question”, and open up the twisties. You’ll find over 170 articles. You can also use the Google search bar. I’ve written a number of posts on how to identify leadership potential. I’ve never seen any research that would suggest the criteria would be different for Gen Y. There’s also a ton of articles on how to develop leaders. Take a look, and if you have a specific follow-up question, please write back and I’d be glad to address it in an upcoming post. Upon reflection, the question got me thinking. How would I go about building a leadership development program from scratch? What would you do if your manager dropped this one on your lap, and you had no idea how to go about it? The consultant answer, and the right one I suppose, would be “it depends” (that’ll be $20,000 please). There is no cookie cutter, one size fits all leadership development program. Every company is different, with different challenges and a unique culture. 1. It starts with really understanding business. Review the annual report, internal and external websites, “Google” your company”, internal business plans, anything you can get your hands on. Do this before you talk to any business leader – do your homework! 2. Interview the head of HR, the CEO, and other key executives and thought leaders. When it comes to talking to the CEO, expect resistance from the “palace guard”. Don’t take no for an answer. You’ll feel like Dorothy, in the Wizard of Oz… “nooobody talks to the great one”. My experience has been that CEOs and other top executives love talking about leadership development, and end up wanting to stay involved. Ask questions about the business challenges, implications for leaders, perceptions of skill gaps, bench strength, what’s already in place, what’s been tried before, and any other advice they have to offer. As you start to develop some ideas of your own, use these meetings to begin testing your assumptions. 3. Review your findings and begin to develop your strategy. What problems need to be solved with a leadership development program? Is there a lack of talent on the senior team? Or middle managers, or supervisors? Or is it a specific function? Which ones and what are they lacking? Is there a lack of successors for key positions? If so, which positions? Is growth an issue? Is there a need to develop for new openings dues to rapid growth? Is the competitive landscape shifting, requiring a new leadership capabilities? Is early identification of potential a challenge? Draft a list of 3-6 goals and measures, then go back and test these with key stakeholders. Verify and refine. 4. In most cases, but not all, it’s helpful to develop a set of expectations (otherwise known as a leadership competency model, in HR-speak) for all leaders. I’ll address how to do this in another post, but the information gathered from interviews should give you a good start. This model will provide you with a framework to begin to develop your program, and to align existing systems (performance management, compensation, hiring, assessments, etc…) around this common set expectations. Again, test, get input, and verify the model. Yes, even with the CEO. I think I’ve covered each of these topics at least once, so I’m going to have to fall back to my original “check my archives” answer. 6. 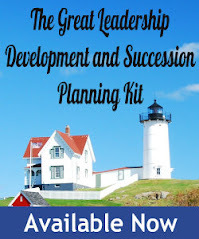 If the issue is rapid growth and the need to prepare new leaders, then a new leader orientation program needs to be built, which could consist of formal training, mentoring or coaching, and other methods to accelerate the learning curve of new leaders. Make sure you survey and talk to incumbents (needs assessment) as a part of your program development process. 7. If there’s some key competency missing with all leaders, or within an important function, then a development program needs to be built to address this area. Again, needs assessment is critical. 8. Programs can be built and delivered internally, externally, or a combination of both. For new leaders, internal usually works. For across the board missing skills, you’ll probably need to go external. For an executive level program, I’d recommend partnering with a top-notch business school, if you can afford it. 9. Implement. Score some wins, get some traction, and build momentum and credibility. 10. Measure, measure, measure, and continuously improve. Repeat steps 1-4 on a regular basis, until you’ve made the “Best company for Leaders” list, and work yourself out of a job. Please comment if there’s a “must” that you feel I’ve missed. I'm no expert on leadership development, but I expected to see a step which calls for a mentoring program. Is it important? Sure, mentoring programs can be very effective. Not sure that's where I would start, but again, it depends - for some organizations and situations, that might be the first and only step.